The purpose of the semi-con is to remove air voids between the metallic shield and the insulation. Shielding is accomplished by wrapping a thin (0.005 in.) copper tape spirally around the insulation to form a continuous shield along the entire length of the cable. This tape may or may not be perforated to reduce losses and is held to ground potential by suitable grounding. 1. Prevent damage from corona. 2. Confi ne dielectric fi eld to the inside of cables or conductor insulation. 5. Provide increased safety to human life. The shield must be grounded at one end and preferably at more than one point. The usual practice is to ground the shield at each termination and splice. Except on 600 V rubber and varnished cambric cables, semiconducting tape is used to separate the conductor from the rubber insulation to prevent possible damage of the insulation from corona and ionization. 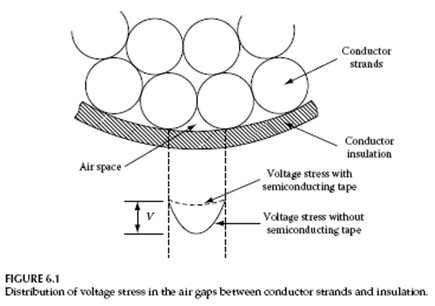 conductor strands and insulation, thereby causing the ionization of air and breakdown of cable insulation. The application of semiconducting tape smooths the voltage stress, as shown by the dashed lines, and keeps such voltage stress constant and to a minimum. This application of the semiconducting tape is known as “strand shielding.” Modern cables are generally constructed with an extruded strand shield.